Imagine yourself sitting on a 12th century wall of a medieval village overlooking the rolling hills of the Tuscan countryside enjoying a meal of unmatched culinary delight. This unparalleled feast of fresh local delicacies has been prepared by you with the help of one of this region’s premier chefs, Giuseppina and her family. 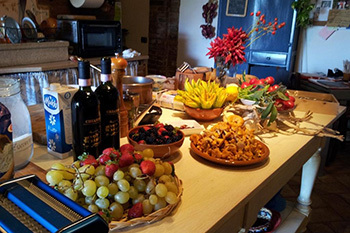 The fresh fare, accompanied by Tuscan wine, will be the culinary experience of a lifetime. 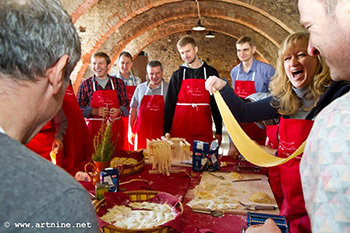 Giuseppina, with over ten years of cooking class experience is the best teacher. 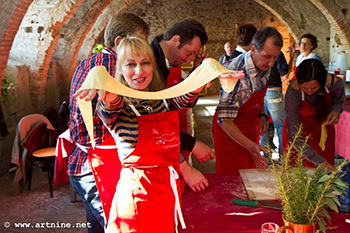 In 2009 she opened (with her sons) the cooking studio of her dreams, an intimate romantic setting in the medieval village of Certaldo overlooking the valley and San Gimignano, another jewel of our area. We believe good food does not need to be complicated. In fact, the best food is often the simplest. Our recipes and our cooking style reflect this fact. Fresh ingredients, treated simply and with respect, are the foundation of memorable meals. We believe food should be delicious, and every meal should be a celebration. So when you come to our kitchen, you will not only learn how to execute a menu; you will also learn how it should taste. Whether you’re a casual cook or a dedicated enthusiast, once you spend time with Giuseppina, you’ll understand it takes more than a recipe to prepare an authentic Italian meal (and why it’s worth it). Each dish will be served in the best moment (hot) , then we will continue with the next course. If a half-day is not enough, start your Full Day Lezoine di Cucina Giuseppina with the selection of the ingredients at the local fresh market. 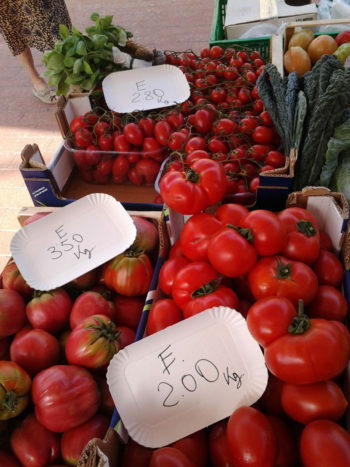 Meet for a cappuccino and brioche at Certaldo’s coffee bar, and then head for the market to see the fresh, local fare. Once all the selections are made, return to the school for a light lunch before you continue your course in the kitchen. Prepare a four-course meal of antipasti, primo, secondo, and dolce before indulging in the results of your hard work. Fresh market visit and tasting, 4 course meal, Wine and apron are included.